Although I love planning and cooking the whole Thanksgiving meal, a few years ago I decided I was just plain bored with the same old same old. The problem was that no one else was. My family and regular Thanksgiving guests wanted no deviation from tradition. I hinted at the notion that maybe, perhaps I would replace the standard stuffing with a fabulous grain-based recipe I had been testing. A rebellion!!! Oh, come on people. Like you need more bread? Fine, the stuffing stays. But that didn’t prevent me from trying to show everyone how overly starchy Thanksgiving is. So I asked, “Can we do away with the mashed potatoes or make them more interesting with some roasted garlic or cauliflower puree?” I’m sure you can guess how that went. Someone asked me the other day what is my favorite part of the Thanksgiving meal. I’ll give you three seconds to guess. Okay, time’s up. The vegetables! Too obvious, I know. Actually, it’s really the salad that is the highlight of the meal for me because I can change it up every year and it’s the only way I get to have any fun at all. The beautiful colors of the vegetables do a lot to balance out all that beige, not to mention balance out all the carbs. I also love eating something raw with all that cooked food. But from a logistical perspective, salads can be made without the use of a stove or oven, which is a saving grace on Thanksgiving. And, as if it couldn’t get any better, salads, for the most part, can be prepped in advance. 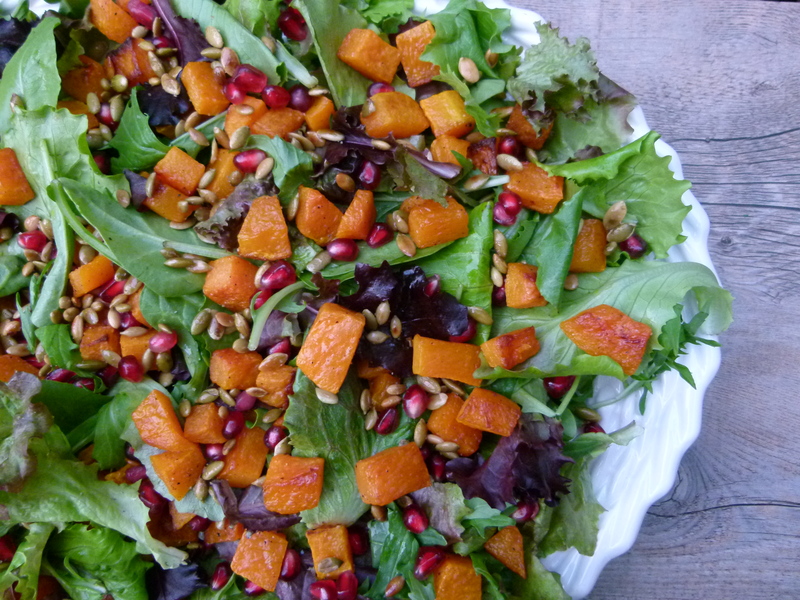 This butternut squash salad is something I made for Thanksgiving a few years ago and I still make it often for entertaining or for potlucks during the fall. It’s beautiful, healthful, delicious and showcases the season’s great produce. I have a theory that fruits and vegetables that grow during the same season usually complement each other very well. 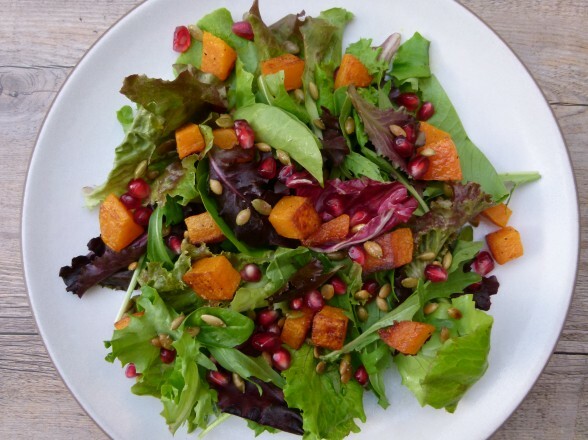 On that note, there aren’t too many fall salads that wouldn’t be more fabulous with the addition of a handful of pomegranate seeds. In fact, I think every Thanksgiving salad I’ve made in the last 8 years has had pomegranate seeds scattered throughout. My kids and I are obsessed with them. It was a happy day in our house the day I came home from the farmer’s market with the first pomegranates of the season. I’ve even taught my kids how to seed them — Mr. Picky, who is a Virgo, is rather meticulous about getting every last seed out. 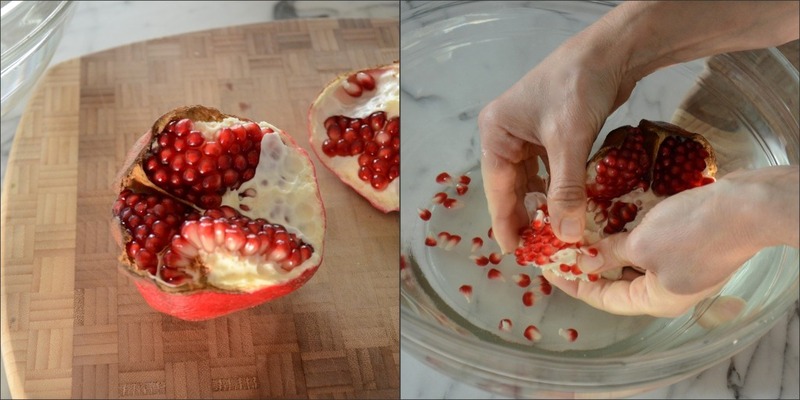 We open the pomegranates under water and gently push the seeds away from the peel. It’s actually quite therapeutic, but more importantly, it keeps me from making a trip to the dry cleaner. Also, people tell me that the already seeded pomegranates always seem a bit soggy. They’re certainly much more expensive and why would you pay your grocery store a premium when you’ve got kids to do the job? 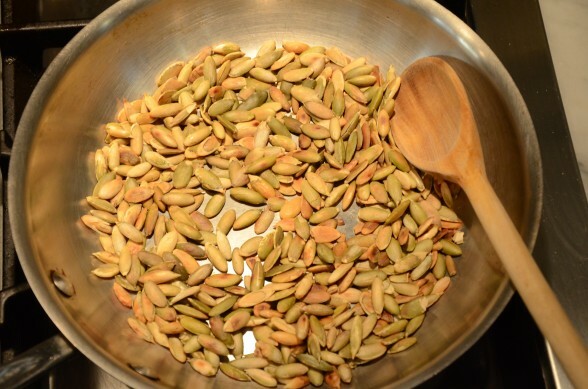 Place the pumpkin seeds in a skillet and toast over low heat until lightly browned. Drizzle with 1 teaspoon olive oil and a pinch of sea salt. Remove from heat and set aside. Try not to eat them all while you’re cooking everything else. 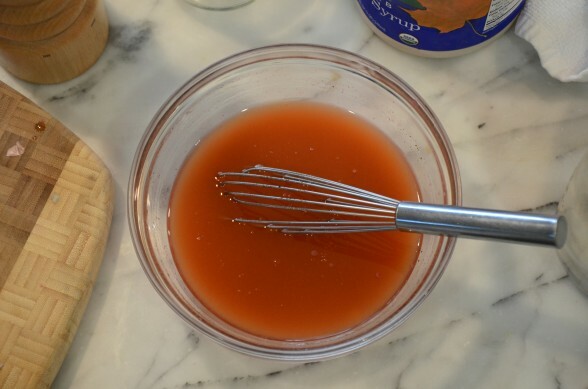 Dressing can be made a few days ahead and kept refrigerated. I made this salad for Thanksgiving and subbed kale for the greens. It was delicious and beautiful for a holiday and a big hit! Can I add beets to this salad? I think it would be delicious with beets! Your site saves me once again! Just made this (w/rosemary option) to bring to Christmas Eve dinner and I know everyone will love it. Ah, one of my favorite salads! It will be a hit for sure. Merry Christmas to you and yours! My two year old loves this dish. She ate 3 helpings last night. She makes sure she picks up every pomegranate seed – which extends dinner from 20 minutes to an hour! Easy dish to make and something that the whole family likes. The pomegranates are a little messy, but worth the mess! Love hearing that! Pomegranates are sort of a pain, but I agree, totally worth it. Season is coming to an end, so get them while you can! I made this salad three times this past week for different dinner parties, and every person asked for the recipe. It’s a crowd favorite. My only problem is I love the butternut squash so much that most of it doesn’t make it into the salad. I’ve had to double up the squash- it’s like nature’s candy! Haha! That’s what I tell my kids. And even thought they love it too, they say it’s no candy. Thanks for sharing all of your yummy knowledge! Lisa, thank you for your continued readership. It’s so nice to finally meet you! And your daughter sounds like my kind of girl. Keep feeding her good stuff. BTW, your blog is adorable! Sounds FANTASTIC! Your family is crazy lucky to have you. Happy New Year! Pamela, just made all the fixings for the salad and will bring to Thanksgiving dinner and toss there. It was really easy as I found fresh cut up butternut squash at Traders (I also find that sometimes when it’s older it’s slimy), used herbs from our garden, and voila. Such beautiful colors and yummy flavors – sure to be a hit – thanks! I hope you had a beautiful holiday, Kim! This s great. Sometimes I get lazy or don’t have the nuts and it is still wonderful. Thank you Pamela! You’re welcome, Jenny. As always, I greatly appreciate your feedback! 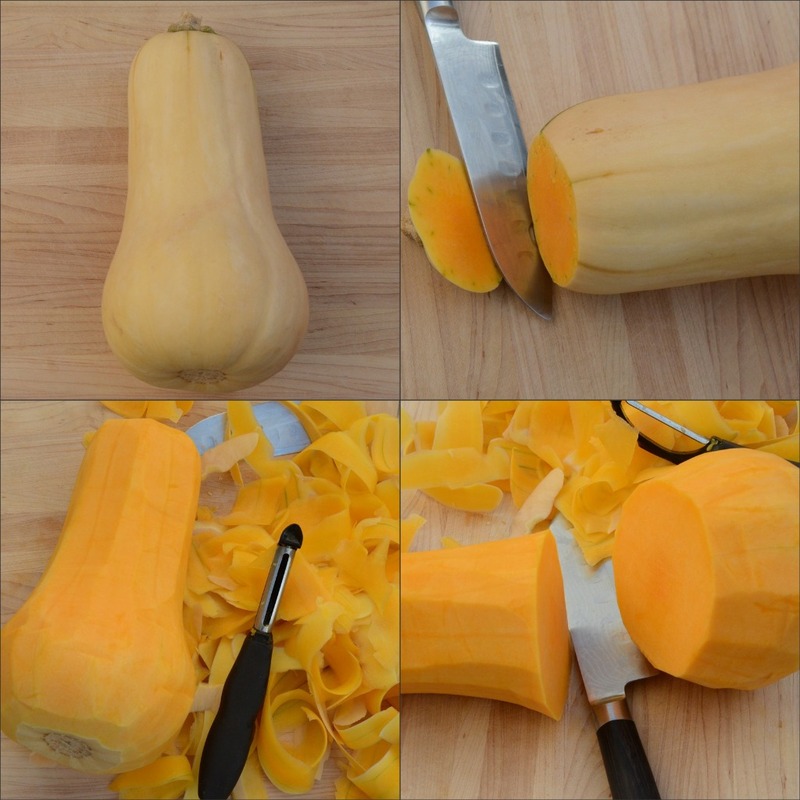 HI Pamela, this is Vivianne (the non-cook whom you’ve actually inspried to cook for the first time EVER:) ), anyway, after being lazy and trying the “easy” and failed way of using frozen butternut squash, I finally bought a non-frozen one! But I almost broke my hand trying to peel it (I’m serious! )and I actually wasn’t able to cut it in half (yes it’s THAT hard) plus the color is more yellow than orange. 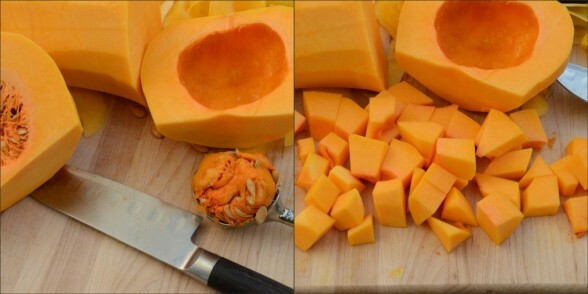 So my question is how can I pick a butternut squash and how do I know when it’s ready? also, would you suggest buying the ones that are already cut? (they sell those at Trader Joes). Thank you so much! Congrats, Vivienne! No turning back now :). 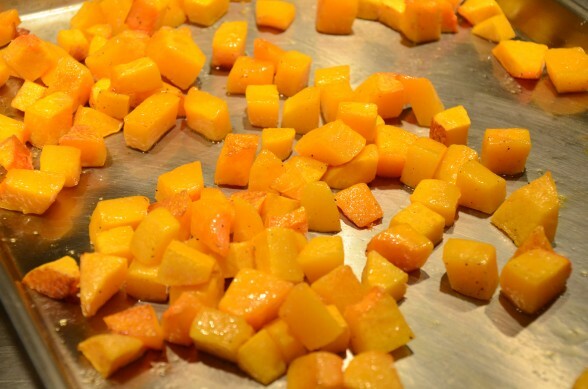 Ok, some of the butternut squash that come earlier in the season may be more yellow than dark orange, but if you roast it, it will still taste sweet and delish. When it’s winter squash season, the squash in the markets should all be good. They should have tight skin and no bruises or soft spots. If you don’t have a good peeler, you can use a sharp knife to slice off the skin. But if you couldn’t cut the squash, you probably don’t have a good knife and that is the most important tool for any home cook. You can buy the squash already cut, but sometimes people tell me it can be a little slimy (who knows when they cut it?) But at this time of year, I think there’s a high enough turnover in the stores that you should be just fine. Thanks again, your recipes are so inspirational! I have to say that this is truly one of the staple recipes in my home that Pamela has taught me in 2 years. 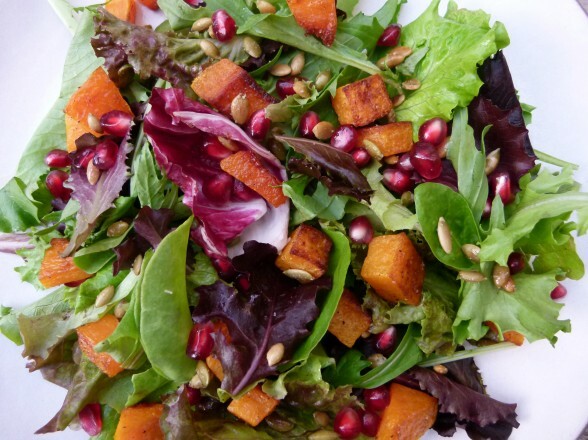 We love the flavors, the soft butternut squash and the crunchy pumpkin seeds and the burst of flavor of the pomegranite seeds. It’s fabulous! Thanks Pamela for adding ANOTHER tradition to my home. this sounds fabulous. pomegranates are a new adventure for me. how do you make fresh juice without making a mess? I almost posted the photo of the pomegranate seeds going into my juicer to make the juice, but it wasn’t a clear shot. That’s the way I do it because it doesn’t make a mess. I think you could also put them through a food mill or place them in a ziploc freezer bag and gently roll over them with a rolling pin and strain the juice. Honestly, before I had a juicer, I would buy pomegranate juice from the farmer’s market or Whole Foods. The rest I would use in smoothies or one year my husband made a batch of pomegranate martinis for Thanksgiving!